On this special Thirukkarthigai day, the temples are all lit up and special prayers are offered. All devotees traditionally offer pori, adhirasam, vella Seedai, vetrilai pakku, fruits as neivedhyam for God Shiva. 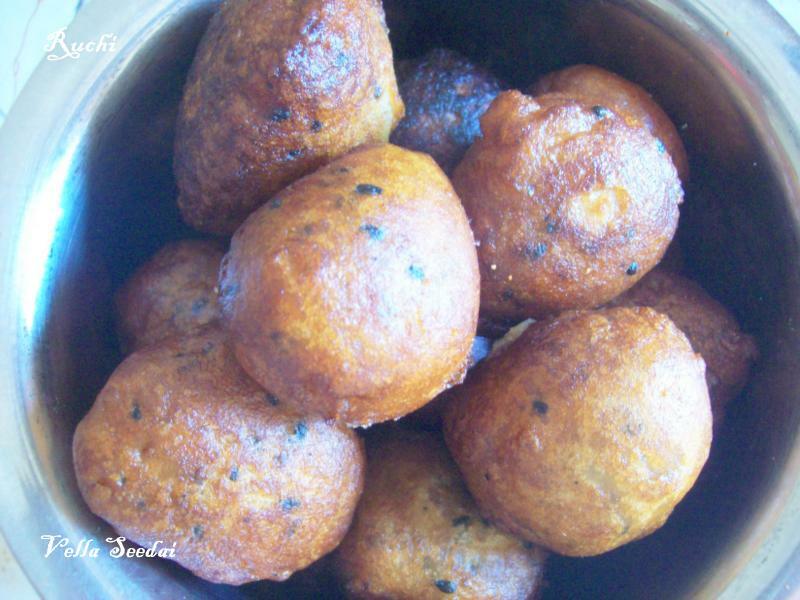 Sweet Seedai or Vella seedai is another dish that is made for Krishna Jayanthi/ Gokulashtamiand for karthikai Deepam. I did not use uraddal flour for the vella seedai, you can include it.This vella seedai is my family favorite sweet dish. 1.Wash the rice, strain and spread on a muslin cloth. Allow about 15 minutes for the cloth to absorb all the water from the rice until it is no longer moist. 2.Blend the rice and then Sieve and blend again repeatedly until into a fine powder. Soak the sesame seeds in water. 3.Add 1 cup water to the jaggery and melt over a low flame. Strain to remove scum. 4.Again boil the jaggery water along with cocunut and sesame seeds and keep stirring it until the jaggery comes to one string consistency. 5.When we take a drop of jaggery water in a finger and rub it with another finger, it should form like a string. This is the correct consistency for the jaggery syrup. 7.The next day, Make gooseberry sized balls of the vella seedai dough and drop around 5-6 balls once and fry it in oil. Super tempting seedai,wish to munch some.